A comprehensive review of the critical issues at the intersection of patent law and food and drug law. Pharmaceutical Patent Law, Third Edition takes on the complicated tasks of tracking legal developments within the Patent and Trademark Office, the Federal Drug Administration (FDA), Congress, the courts, the Federal Trade Commission (FTC), the Department of Justice, and the World Trade Organization; examining how these agencies and organizations interact with each other; and determining how they impact strategies within a practitioner’s core area of expertise. 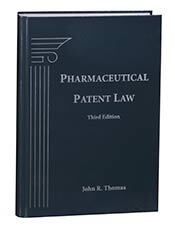 This treatise is the only reference available with a detailed, practitioner-oriented treatment from the perspective of both patent law and food and drug laws. Pharmaceutical Patent Law provides complete coverage of advanced topics, including the antitrust implications of patent settlements, the experimental use privilege, and international aspects of the field. Core topics covered include follow-on biologics; the substance and procedure of pharmaceutical patent acquisition; FDA marketing approval procedures for innovative and generic drugs, as well as FDA marketing exclusivities; the FDA’s Orange Book; and patent term extension standards.